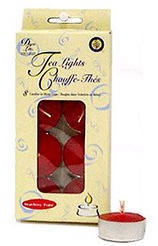 Fill the air with the delicious scent of strawberries with Strawberry Tea Lights! This set includes 8 long-lasting candles that are ideal for aromatherapy oil burners or for small candle holders. Richly colored in a strawberry red tone and lightly scented, these lights can also be used on their own placed atop the side of a bathtub, or as a floating display with flower petals in a vase. Treat yourself to the pleasant aroma of sweet strawberries!